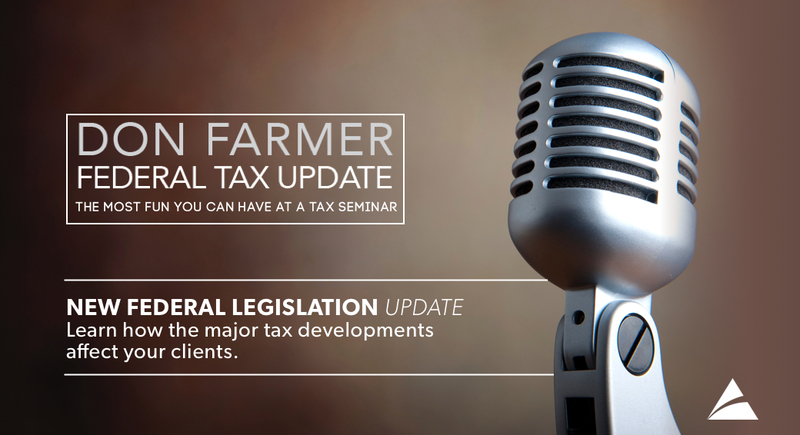 January 25, 2018 | 8:30 a.m. – 4:30 p.m.
Be prepared to laugh while learning about the latest developments that affect federal taxation at the annual Don Farmer Federal Tax Update. This is COCPA’s most popular tax program and regularly receives top instructor evaluations. This essential training provides a thorough and engaging review of current-year developments, recurring problems, and planning ideas affecting individual tax returns. Don was formerly a Tax Partner with Deloitte, Haskins, & Sells in charge of the tax practice for their five Western North Carolina offices. He resigned his position as partner and became a consultant in order to devote his time to writing and lecturing. He also consults with other CPA firms concerning tax matters. Each year, Don writes and presents CPE programs across the United States. Don received the American Institute of Certified Public Accountants’ (AICPA’s) Outstanding Discussion Leader Award for every year he presented qualifying AICPA programs. Don has also contributed articles to nationally known tax magazines.